Adapting the complex big data into your projects will be one of your strengths! Your mission to integrate big data is not limited to the use of sophisticated tools to solve your problems, but you must align the requirements of your activities with data lake or data warehouse through clear and correct strategies, taking into account your business as a goal. This provides support to your companies in all stages of your projects: from defining and taking requirements to start production and subsequent maintenance. Finally, it will help you create sustainable and stable competitive advantages. Today we are witnessing a strong enthusiasm around the theme of big data. Publications of different natures and demonstrations multiply and the promises also, without really defining the outline of the phenomenon, to be able to approach it as a real project and not as a fuzzy and ephemeral technological mode. Big data is an extraordinary opportunity for a company, a sector or even a country. Indeed, it allows having the useful and necessary knowledge at the right time to better manage the growing complexity of the operational. To take full advantage of this large amount of data, the first step is to define the process by which data should be collected, processed and analyzed. Then, we must identify the most appropriate business domain to launch a pilot or a Proof of Concept. Subsequently, we must validate the choice of tools and appropriate technologies and finally build an organization and governance to sustain and enhance the big data initiatives. If some companies are already engaged in big data initiatives, the difficulty for others, especially small businesses and entrepreneurs, is how and where to start? Here are the important keys to implement when starting a big data project. These different points that we put forward will allow future entrepreneurs to better understand the experience of value creation based on the big data analytics, as a whole. 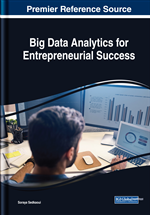 These tools will shed light on the conditions of success for entrepreneurship in the big data universe and on the different actions to be implemented. Data Analytics, big data, and machine learning are very popular terms in today’s business world. However, perimeters encompassed by each of these terms overlap meaning different things. From a data point of view, big data refers to several Vs, in addition to the three famous Vs, which highlight the ability of traditional tools to process and analyze the available data (collection, storage, analysis, integration, etc.). In this chapter, I will start by describing the workflow that can be adopted to better explore the data. Typically, I will explain how the data analytics process can be applied when working with big data in general. But it should be noticed that, due to its experimental side, the data analytics will empirically run this workflow. As a result, this experimental model of work is not linear, but iterative: The analyst or the entrepreneur, who want work with data, will define a hypothesis, implement it, and then refine it. Usually, a big data analytics process is represented in the following form. Data Lake: Is a collection of storage instances of various data assets added to the originating data sources. These assets are stored in a near-exact, or even exact, a copy of the source format. The purpose of a data lake is to present an unrefined view of data to only the most highly skilled analysts, to help them explore their data refinement and analysis techniques independent of any of the system-of-record compromises that may exist in a traditional analytic data store (such as a data mart or data warehouse). Data Analysis: This is a class, of statistical methods, that makes it possible to process a very large volume of data and identify the most interesting aspects of its structure. Some methods help to extract relations between different sets of data, and thus, draw statistical information that makes it possible to describe the most important information contained in the data in the most succinct manner possible. Other techniques make it possible to group data in order to identify its common denominators clearly, and thereby understand them better. Natural Language Processing (NLP): An interdisciplinary field of computer science, artificial intelligence, and computational linguistics that focuses on programming computers and algorithms to parse, process, and understand human language.